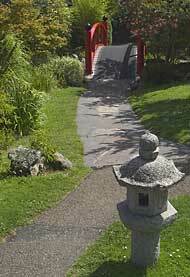 By PATSY HOLLIS | A bright red-enamelled arched bridge crosses a pond. In the background is a rough-timbered mill and churning waterwheel. Sped by its blades, water cascades down large boulders and rocks. There are no bad spirits here. It is both exalting to one’s own spirit and curiously calming too. The design blends plants, granite lanterns, low bamboo fences and flagstone pathways bounded by clipped hedges. There are areas of raked pale gravel studded with huge lichen-encrusted boulders. 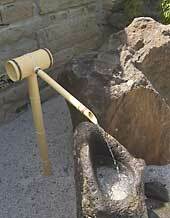 There is a traditional bamboo Shishi odoshi (deer scarer) and a teahouse. 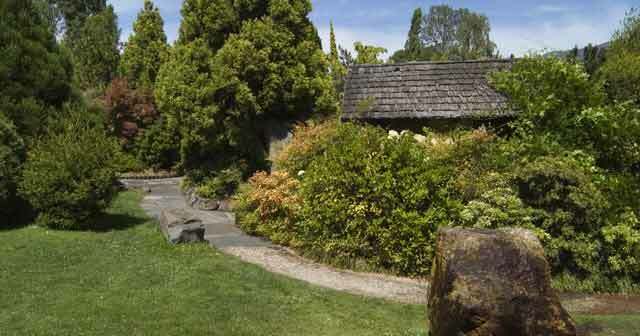 In the Royal Tasmanian Botanical Garden’s own words: “Stones create feelings of security, permanence and age. They are laid out asymetrically to suggest the rugged wildness of nature. 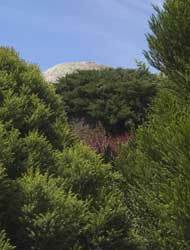 Evergreen trees represent constancy, while deciduous trees highlight changing seasons. 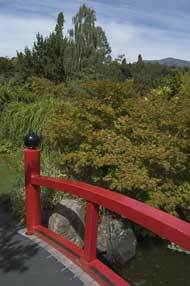 Hobart’s sister city in Japan is Yaizu and in 1987 the Japanese Garden, designed by Yaizu landscape architect Kanjiro Harada, was opened in honour of this relationship. To give a sense of tradition there is a representation of Mt Fuji, its conical top capped with concrete snow and its distinctive pyramid carpeted with low-growing plants. Because the climate of cool misty Japan with its hot summers is so similar to the climate of Hobart, all the plants thrive. It doesn’t matter which season one visits the Japanese Garden, all are beautiful, although perhaps autumn with its interplay of russet and gold reflecting in water is the most memorable. All the plants are species native to Japan or cultivars, and the camellias (many donated by the Tasmanian branch of the Australian Camellia Research Society) are outstanding. The camellias are in full bloom in August and September, their place taken by flowering cherries outside the lower gate in blossom late September/early October. Early October also sees the deciduous azaleas displaying spectacular flowers on bare branches. Evergreen azaleas bring colour for many cooler months of the year. 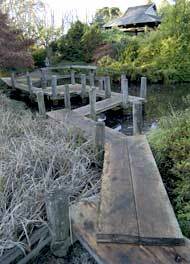 In November and December look for the waterlilies, and the brilliant flags of Japanese iris. For the height of autumn colour, it’s late April to early June — while the conifers of all shapes, sizes and colours are on parade all year round.